The Proof Silver Native American Dollar Coin Series from the Native American Mint is a vast and diverse range of silver products. Introduced back in 2015, the collection catalogs the history and culture of First Nation and indigenous tribes in North America with designs reflecting the people and their surrounding environments from across the continent. 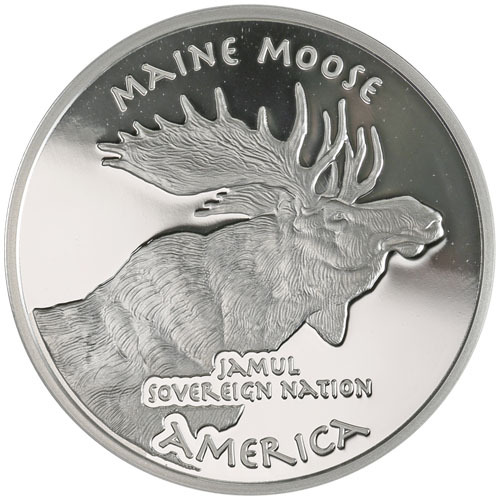 Right now, 2019 1 oz Proof Silver Maine Passamaquoddy Moose Coins are available to purchase online at Silver.com. 21st coin in total in the series and first to debut in 2019! Bears a face value of One Dollar. 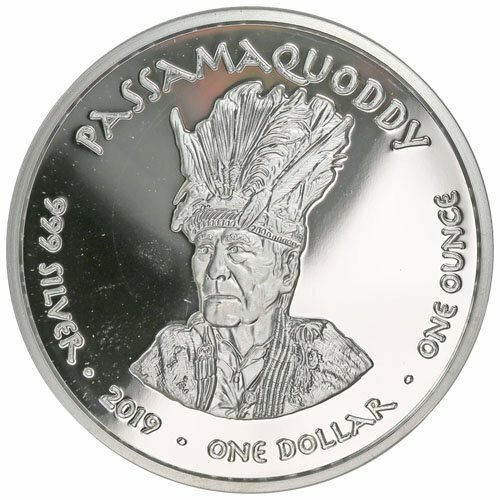 Obverse design includes the portrait of an elder from the Passamaquoddy tribe. Reverse depicts the massive frame of a moose. Issued for Maine and the Passamaquoddy by the Native American Mint. Coins DO NOT have legal tender status in the US. Each of the 2019 1 oz Proof Silver Main Passamaquoddy Moose coins in this product listing comes to you with its own protective capsule. The coins in this series have a face value of One Dollar nominally backed by the issuing tribe, but the coins do not hold legal tender status in the United States. The US Mint is the only facility under federal law permitted to strike fiat currency or bullion coins with US legal tender status. The Passamaquoddy Moose coin is the first to feature in the 2019 release of Proof Native American Dollar coins. The Passamaquoddy people have long inhabited the northeast region of the United States and small stretches of southeast Canada in what is now New Brunswick. The Passamaquoddy people of today have a different status in these two nations today. On the obverse of the 2019 1 oz Proof Silver Maine Passamaquoddy Moose Coin, you’ll find the vision of a tribal elder. The majority of Passamaquoddy people live in the US today and hold a special political status in Maine that allows them to send representatives to the Maine House of Representatives. Though the Passamaquoddy in Canada has a chief, Hugh Akagi, the tribe is not recognized as a First Nation tribe by the Canadian government. The reverse side of the 2019 Proof Silver Passamaquoddy Moose Coin features the image of one of the largest mammals on the North American continent. The moose is a member of the New World Deer species, and is the largest and heaviest member of that species. If you have any questions, please feel free to reach out to Silver.com. Our customer service team is available to you at 888-989-7223, online using our live chat service, and via our email address.